Sadly there is still a significant portion of the population who will automatically assume that "different" is actually "bad" and is more than happy to show this equation in their treatment of others. Individuals with disabilities, unfortunately, are therefore open to poor treatment and discrimination from such people. However, while the disabled may end up victims of discrimination, there is much that can be done to confront discrimination due to disability. Confronting an individual when it is safe to do so, reporting an organisation when needed and educating others are all steps that anyone can take to help stamp out discrimination due to disability. Many individuals will make discriminatory remarks or jokes about others with disabilities, but this obviously does not make it right. If it is safe to do so, confronting such individuals with a short, no-nonsense line such as "I can't believe you just set that" or "What a disgusting sentiment" can often turn the tide of a conversation, particularly if others are involved. Exiting a conversation after such a line will not only help keep you out of harms way (both from a physical and verbal reaction) but it will also help you make the point that you want nothing further to do with that individual. If you happen to see discrimination taking place, or you are the one experiencing discrimination, letting others know that you are aware of what is happening is often enough to stop the discriminatory practices. If it is not enough, however, leaving the immediate location and reporting the discrimination is usually a better option. The UK Disability Discrimination Act of 1995 (amended and extended in 2005) is overarching legislation that both defines disability and discriminatory behaviour and practices in the United Kingdom. If it is believed someone is in breach of these Acts, taking them to court is one way of reporting and hopefully stopping their actions. Reporting discrimination due to disability to local authorities is another method of calling attention to inappropriate practices, and reporting instances of discrimination to organisations working for disability rights may also help to eradicate such behaviours. The Equality and Human Rights Commission, the Disability Alliance UK and DIAL UK are all such organisations operating throughout the United Kingdom. Though it is not right, it is often left up to the individuals who recognise discrimination to educate others about why these practices are inappropriate. 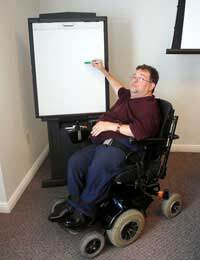 Often educating others about disability is the first step in this process, as demystifying disability can help others see that people with disabilities are people just like them with some limitations. If offering information on disabilities is not enough to stop discrimination, then educating others about the law and the consequences of discrimination - particularly if it pertains to their freedom or livelihood - may get through to them. If not, reporting discrimination and getting authorities involved will hopefully cause the discrimination to cease whether anyone's mind has been changed or not. Discrimination against individuals with disabilities is both inappropriate and illegal, but sadly it does still occur. Confronting individuals about their thoughts and actions, reporting organisational discrimination and educating others about disabilities and the laws are all ways to confront discrimination due to disability when it does occur. @speedy - I'm not surprised you feel this way, he sounds like a real misery. He should be behind you and being supportive of your chance to go and enjoy yourself. I would ignore his comments completely and go away and have a good time, you don't need people like that in your life to bring you down. Have a great holiday!